A recent column by Annette John-Hall can serve as a valuable teaching tool on propaganda, voter integrity, and the soft bigotry of low expectations. This coming week I have decided to use Inquirer columnist Annette John-Hall’s article “A retired CEO can’t top voter ID hurdles” as part of my lesson on persuasive writing in my 10th grade English class. Below are three issues we will cover, including questions for class discussions. To make sure that a person arriving at a polling site is the same one who is named on the list, we propose a uniform system of voter identification based on the “REAL ID card” or an equivalent for people without a drivers license. To prevent the ID from being a barrier to voting, we recommend that states use the registration and ID process to enfranchise more voters than ever. The Supreme Court of the United States agreed. In 2008, the court upheld Indiana’s photo ID requirement, ruling that it was a non-discriminatory means of protecting the integrity of elections. In Texas, evidence of voter fraud abounds. In recent years, my office has secured more than 50 voter fraud convictions. Those include a woman who voted in place of her dead mother, a political operative who cast ballots for two people, and a city council member who registered foreign nationals to vote in an election decided by 19 votes. Voter fraud is hard to detect, so cases like these are just the tip of the iceberg. Still, supporters of voter ID laws insist that one case of voter fraud is all it takes to spoil the integrity of our electoral system and justify voter ID laws. Discussion Questions: Are voter ID laws needed to protect the integrity of our electoral system? Is one case of voter fraud enough to justify these laws? Why or why not? These were the words of George W. Bush in a 1999 speech on improving education. The same can be said of voter ID laws and the need to educate Americans on the importance of voting and acquiring the proper ID to do so. Helping the poor and disenfranchised get an ID is much broader than simply voting; it is giving them the documentation necessary to both navigate and participate in 21st century society. Currently, a valid ID is needed to cash a check, apply for working papers, apply for a marriage license, apply for a mortgage, fly on a plane, get a credit card, buy a car, rent a car, rent an apartment, rent a post office box, buy alcohol, cigarettes, a gun, take out student loans, take out home equity loans, leave the country, get back into the country, get car insurance, get life insurance, get home owners insurance, etc. One would think those interested in empowering the poor and disenfranchised–those interested in helping struggling people better their lives–would do everything they could to help those in need secure a valid ID. Interestingly, people like Annette John-Hall rail against voter ID and all its transformative benefits like the plague. Instead of pouring their energy into getting the needy up to speed, they spend their time trumpeting to the world and all who will listen why the poor (and the young, and the old, and students, and minorities) CAN’T comply. Can’t, can’t, can’t, can’t, can’t. No way. Impossible. Just too hard. Too daunting. They engage in laborious studies on why a minute group of Americans can’t overcome basic challenges, like the Brennan Center for Justice’s report “The Challenge of Obtaining Voter Identification.” How much money was spent on this report, and more importantly, how many thousands of IDs could have been acquired and given to indigent Americans in its place? Why? Here are the three best arguments against voter ID laws to date, as concluded by the Brennan Center: state ID-issuing offices have limited hours, long lines, and in some cases, require the use of public transportation. This is what people like John-Hall call “Jim Crow.” Those minority of Americans (less than 11 percent of the population) who want to vote and don’t have an ID have to take a bus, wait in a line, and coordinate both of these activities to fit into a time when the ID-issuing office is actually open for business. Most Americans (75 percent) support voter ID laws and believe it is by no means unrealistic (or discriminatory) to expect Americans to be able to perform these aforementioned tasks. Many will argue that assuming citizens are unable or unfit to do so is condescending, counterproductive, and a hindrance to their well being and growth; some will argue that such low expectations are the true source of voter suppression. Discussion Questions: How might Annette John-Hall’s low expectations of the poor and disenfranchised influence their ability to vote? How might these low expectation hurt society as a whole? Does John-Hall have any underlying political motives or agenda for opposing voter ID laws and voter education? Well, as it turns out (as it is revealed near the end of John-Hall’s article), DeCarlo didn’t have a problem; his ID is fine, his voter registration card is fine, and he will be able to vote in November, just like he’s done for the last 50 years. So why is John-Hall’s article headlined “A retired CEO can’t top voter ID hurdles”? Doesn’t not being able to “top voter ID hurdles” mean not being able to vote? No, it doesn’t. This is the convoluted and misleading game played by John-Hall and her editors–a propaganda technique known as a “red herring.” The voter ID hurdles DeCarlo wasn’t able to clear involved going down to a DMV office and dealing with a “bureaucratic shuffle,” receiving a bit of frustrating misinformation from a clerk that was later rectified; if people like John-Hall simply cooperated with voter ID laws and voter education instead of railing against it, perhaps DeCarlo may have known that, according to votespa.com, “photo IDs do not need to exactly match their voter registration, but the names must substantially conform.” DeCarlo may have also known that as a senior citizen, he could have simply cast an absentee ballot. But to those busy readers who only happened to skim John-Hall’s headline (or only read the intro to the piece), one would think DeCarlo had his right to vote “suppressed.” Of course, nothing of the sort happened. In PA, the state has spent millions on voter education and has set up a website to assist anyone interested in voting to acquire an ID (in many cases free of charge), register, and get to their polling place to vote. Even if a person doesn’t have a photo ID, or they are indigent and unable to obtain one without payment of a fee, they can cast a provisional ballot and will have six days to provide their photo ID and/or an affirmation to their county elections office to have their ballot count. Senior citizens, the disabled, and others unable to get to their polling place can cast an absentee ballot. Discussion Questions: Is Annette John-Hall’s article propaganda? Is her use of a red herring dishonest journalism? How might this misleading information harm the public’s trust of voter ID laws and negatively impact the integrity of newspapers? Last Sunday marked the start of the 100-day countdown to “Taxmageddon”—the date the largest tax hikes in the history of America will take effect. On January 1, 2013, the Bush tax cuts are set to expire, prompting many of my fellow teachers to say, Great! Let the richest Americans finally start paying their fair share! The only problem is, Bush’s tax cuts weren’t simply for the rich (as many Americans have been led to believe), but for all Americans at every tax bracket. The deduction for tuition and fees will not be available. Tax credits for education will be limited. Teachers will no longer be able to deduct classroom expenses. Coverdell Education Savings Accounts will be cut. Employer-provided educational assistance is curtailed. The student loan interest deduction will be disallowed for hundreds of thousands of families. This really stings, being that I spent over $12,000 on graduate school tuition this year (which I will no longer be able to deduct from my income taxes in 2013). To make matters worse, all the money I spent on classroom materials in 2012—such as paper, posters, ink cartridges, CDs, DVDs, pens, markers, magazines, flash-drives, file folders, pencil sharpeners, in/out baskets, computer speakers, etc.—will no longer be able to be deducted from my tax returns. The “marriage penalty” (narrower tax brackets for married couples) will return from the first dollar of taxable income. The child tax credit will be cut in half from $1000 to $500 per child. The standard deduction will no longer be doubled for married couples relative to the single level. Imposes a cap on FSAs of $2500 (now unlimited). Indexed to inflation after 2013. There is one group of FSA owners for whom this new cap will be particularly cruel and onerous: parents of special needs children. There are thousands of families with special needs children in the United States, and many of them use FSAs to pay for special needs education. Tuition rates at one leading school that teaches special needs children in Washington, D.C. (National Child Research Center) can easily exceed $14,000 per year. Under tax rules, FSA dollars can be used to pay for this type of special needs education. This Obamacare cap harms these families. Curiously, a woman I teach with this semester is married, has a special needs son, and is in graduate school working on a Master’s in Education. Between the rise in her income tax rate, the Special Needs Kids Tax, and the fact that she will no longer be able to write-off the tens of thousands of dollars she spends on tuition and classroom materials, her finances will be taking a real beating. The drop in PSSA test scores cannot be attributed solely to improved test security. Cuts in education funding, though not acknowledged by state officials, are also to blame. The official results of the 2012 PSSA exams are out and it seems everyone is pointing fingers. Math and reading scores are down 1.5 points statewide, and an average of 8 points in Philadelphia. Teachers unions are blaming cuts in education funding for the slump in student performance, and it appears they have a legitimate argument. Last school year Governor Corbett cut $860 million from K-12 education, which translated to about $410 per student. These cuts hit impoverished school districts the hardest; in Philadelphia, state education funding decreased by about $557 per student. “When resources are pulled from our schools, scores drop,” Jerry Jordan, president of the Philadelphia Federation of Teachers, said. Education Secretary Ron Tomalis insisted the drop in PSSA scores had nothing to do with recent changes in funding. “I don’t buy the excuse the numbers went down because of budget cuts,” he said. According to Tomalis, scores are down because of heightened test security put in place during last spring’s PSSAs. This conclusion was backed by the state’s Technical Advisory Committee, which studied three possibilities for the drop in scores: funding, changes in the test content, and tighter test security. The data to support TAC’s findings in the recently released 2012 PSSA Official Report is insufficient, however. Although TAC states “that the only scientific cause for the drop in scores from 2011 to 2012 was the Department’s investigation of past testing improprieties which has led to heightened test security measures,” no analysis of the effect of changes in funding is given in the 2012 PSSA report. How did cutting $860 million from K-12 education impact testing, exactly? How did losing hundreds of teachers, nurses, librarians, counselors and school police affect test scores? How did losing art, music, foreign language, sports programs, clubs, and a multitude of other extracurricular activities impede education? TAC never adequately addresses these issues in the report. Selective interpretation of test data seems to be the Pa. Dept. of Ed.’s modus operandi. Also missing from the 2012 PSSA report are the forensic audits of the 2010 and 2011 PSSAs, as conducted by the Data Recognition Corporation—the makers of the PSSA. A neatly arranged, prepackaged analysis of the state’s “Integrity Investigation” into cheating on past exams is contained in the report, but this investigation is by no means an adequate substitute for the original audits of the 2010 and 2011 PSSAs themselves. Pennsylvania tax payers have a right to review the primary documents and draw their own conclusions about which schools and districts cheated on the 2010 and 2011 PSSAs; my gut feeling is still that the Philadelphia School District, although clearly guilty of widespread cheating, was made the primary scapegoat by the state. The state has also failed to explain why they waited until shortly before the start of the 2012 PSSA to announce its new security policies regarding the administration of the exam, and why only Philadelphia and a handful of other districts were required to abide by the new security measures. If cheating was so widespread, why weren’t the security measures mandated statewide? Tragically, it appears that the state’s obsession with testing and test security is only going to get worse. While Corbett’s 2012-13 budget keeps school funding generally flat, it increases spending on educational assessments by 43 percent to $52 million. The drop in PSSA test scores, especially in large urban districts such as Philadelphia, cannot be attributed solely to improved test security. The state’s claim otherwise is purely political, and until supported by sufficient data, lacks legitimacy. Just as men are replaced by bureaucrats in “The Life of Julia,” so are parents being replaced by schools in today’s public education system. The Philadelphia School District isn’t the only school system who is revising their discipline code and easing up on school suspensions. The state of New York recently announced it is doing much of the same. The reasoning behind reshaping discipline in public schools, which is a movement that is gaining national momentum, is the belief that suspending students is ineffective and causing children to miss too much school. The major purpose behind suspensions, however, isn’t to keep a child from learning or getting an education. As any seasoned teacher or school administrator will tell you, school suspensions are primarily issued as a means of home remediation–they are given when the school’s limited resources can no longer adequately remedy a problem behavior and the full might of parental power and influence is needed to rectify a problem. In other words, suspensions are a red flag to a child’s parents that they had better start circling the wagons at home in order to instill in the child–as only parents can–that school, and respecting the student code of conduct, is super, duper, important. In all my years in school I never once was suspended. Ever. Not for chronic truancy, or tardiness, or uniform violations, or for talking back to (or cursing at) a teacher. This is saying something, being that I went to 12 years of Catholic school. If I would have ever gotten suspended, it would have been curtains for me. Lights out. My parents would have dropped the hammer, and I didn’t take this reality lightly. But I mostly respected the rules because I loved my parents and they loved me, and because doing well in school and following the rules was the right thing to do; back in the day, when traditional families with common core values were still the norm, there was something known as morality. Today things are very different. In many cases, especially in urban districts, suspensions no longer result in effective parental remediation. A child is sent home for a week to think about changing his behavior, and to force his or her parents to use family resources to address the situation head-on, but not much happens. Single parents (over 70 percent of African American children are born out-of-wedlock) are too overwhelmed to become reliable agents of change. Many parents, who became pregnant in their teens, are too inexperienced to even know what to do. So often times, school suspensions don’t result in much of anything at all. Kids who misbehave continue to miss school and fall further behind. The government’s answer to this problem, as noted above, is to cut-down on suspensions. The only problem is, schools don’t have one-tenth the amount of resources to properly rectify the kind of behavior problems exhibited by students in the 21st century. In the end, cutting-down on school suspensions ends-up compromising the educations of the hardworking majority of kids whose rights are violated daily by a minority of violent and unruly students forced to coexist with them in the classroom. But out-of-touch civil rights groups and government bureaucrats don’t seem to care. In fact, the current White House believes so firmly in the nanny state that Education Secretary Arne Duncan truly accepts the notion that schools can take the place of parents. What used to be achieved at the hands of an out-of-school suspension must now be somehow achieved in-school by teachers and other school administrators. Such thinking is not only absurd and unrealistic, but is truly un-American. Our country’s Founding Fathers envisioned a place where people were free to pursue their own destiny through individual achievement and personal responsibility. When Thomas Jefferson invented the idea of a public school system, the purpose was “to enable every man to judge for himself what will secure or endanger his freedom.” Jefferson started public schools so all children, not just those who could afford to pay, could have the opportunity to receive an education. He offered the opportunity. Those who do not wish to take advantage of this opportunity, however, shouldn’t be free to rob others of their right to learn. Again, today’s Big Government policy makers see things a bit differently. An example of this is President Barack Obama’s “The Life of Julia,” his administration’s plan to allow Americans to live off the government from the cradle to the grave. Barack Obama has a new composite girlfriend, and her name is Julia. 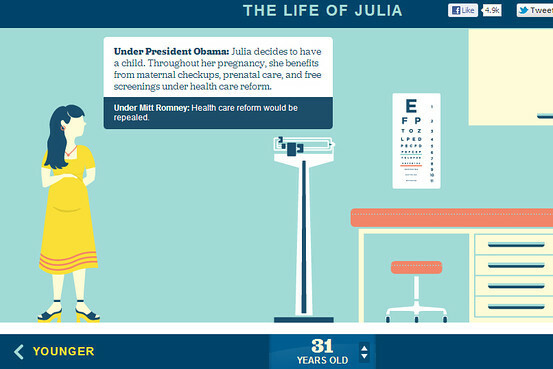 Her story is told in an interactive feature titled “The Life of Julia” on the Obama campaign website. Julia, who has no face, is depicted at various ages from 3 through 67, enjoying the benefits of various Obama-backed welfare-state programs. . . .
At 31, the story tells us, “Julia decides to have a child. Throughout her pregnancy, she benefits from maternal checkups, prenatal care, and free screenings under health care reform.” In due course she bears a son named Zachary, the only other character in the tale. Harsanyi is right. Obama is setting forward a vision contrary to the American tradition of self-sufficiency–a welfare state that runs from cradle to grave. And it’s a dishonest vision, because it presents all of these benefits as “free,” never acknowledging that they are paid for through coercive taxation. The most shocking bit of the Obama story is that Julia apparently never marries. She simply “decides” to have a baby, and Obama uses other people’s money to help her take care of it. Julia doesn’t appear to be poor; at various points the story refers to her glamorous career as a Web designer, and it makes no mention of her benefiting from poverty programs like Medicaid or Temporary Assistance for Needy Families. In 1999 Lionel Tiger coined the word “bureaugamy” to refer to the relationship between officially impoverished mothers of illegitimate children and the government. “The Life of Julia” is an insidious attack on the institution of the family, an endorsement of bureaugamy even for middle-class women. Tagged as Barack Obama, Bureaugamy, David Harsanyi, Lionel Tiger, New York Department of Education, Philadelphia School District, School Discipline, School Suspensions, The Life of Julia, The Lonely Life of Julia, The Nanny State, Wall Street Journal, Who the Hell Is 'Julia' and Why Am I Paying for Her Whole Life?